Are you wondering how to pack hot and warm foods in a school lunch? I’m often asked how to pack warm items, like grilled sandwiches and quesadillas, inside a school lunch. I wish I could answer all of your questions with the answers that you want to hear. The truth is that you simply cannot pack a hot item in anything other than a thermos and expect it to hold its temperature for long. You can prolong the heat retention, like in this post, where I show you how to pack a baked potato in a lunch box. Essentially, it comes down to this: If you want the food to stay hot, you must find a way to put it in a thermos. So, if it doesn’t fit in a thermos, it’s not going to stay hot. Warm items are a completely different story. If you want to know how to safely keep foods warm inside a thermos, check out this post I wrote. So then, what’s the point of grilling a quesadilla in the morning and packing it in a lunch box? When you grill a quesadilla (or a sandwich) for a school lunch, you do so to “marry” the flavors together. When the cheese melts, it also holds the food item in one piece. We all know that grilled sandwiches and quesadillas are delicious. I attribute much of the yum-factor to the grilling process that makes the cheesy flavor ooze its way into the other foods inside the tortilla. Example: these apple and cheddar quesadillas. Who doesn’t love apples and cheese? Take that combination and now, grill it! 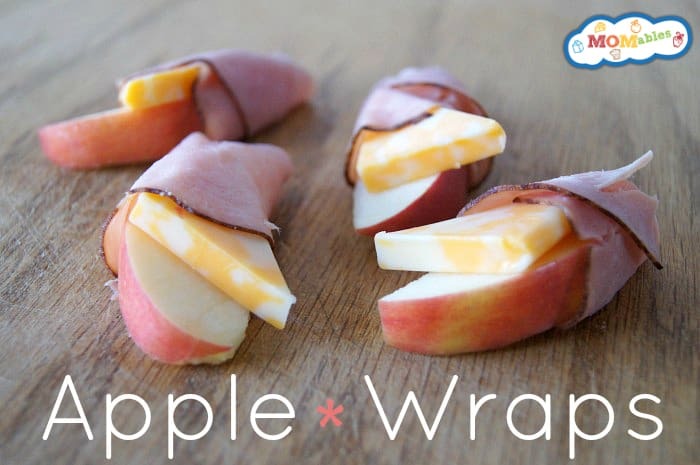 It completely changes the flavor and texture of the apples+cheese combination. Apples are abundant in our grocery stores year round. 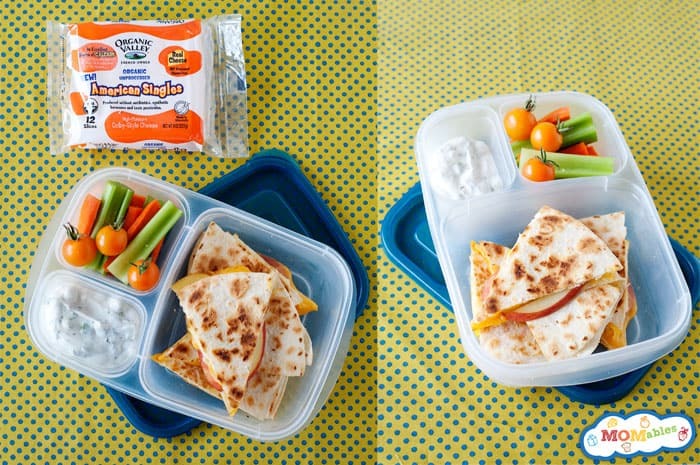 For this recipe, choose your child’s favorite variety, and use it in this quesadilla. For this recipe, I used Organic Valley Unprocessed American Cheese. Yes, you read this correctly, unprocessed. Go ahead, read it again: unprocessed. Until a few weeks ago, I had never heard of unprocessed American cheese. Last year, I spent more than $300 on cheese trying to come up with a homemade Velveeta recipe that performed as good as the real thing. So, when you e-mailed me with your concerns regarding processed cheeses, I told you that I was using mild cheddar instead. Of course, you argued that the “melt factor” and flavor wasn’t the same (I agree). I’m happy to share that I finally found an unprocessed American cheese that is real cheese (no processed cheese food), has that mild cheesy taste kids love, melts just like those singles, and for the foodies, it’s made with certified organic milk, no antibiotics, pesticides, hormones, or GMOs. 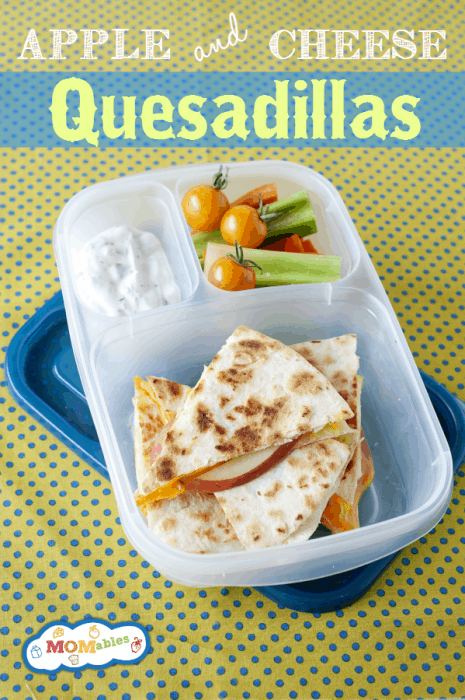 So how exactly do you pack a quesadilla in a lunch box as shown? 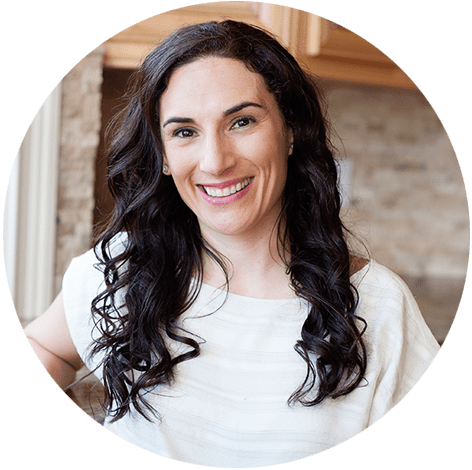 Click on this recipe link to find out (this is a free recipe for meal plan members and non-members). 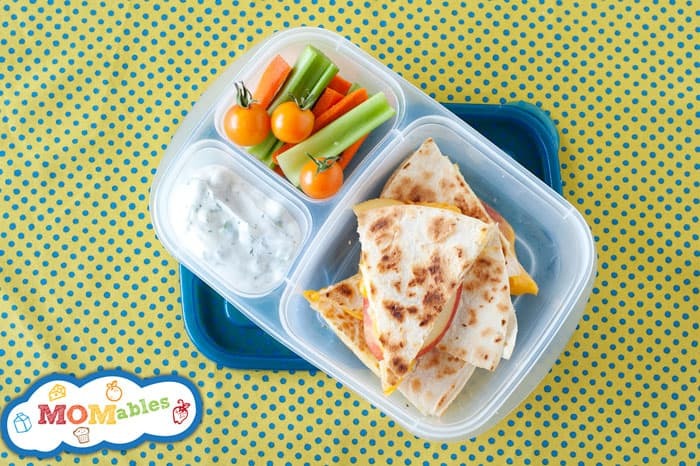 Just like in all of our MOMables menus, I tell you exactly how to pack items in a lunch box so that they are at their best by lunchtime. I have the same questions Kristin Russell posted. Soggy? Condensation? Etc. Check out this youtube video where I show you how to pack a grilled cheese for lunch. The same principles apply to a quesadilla. Enjoy! Where can you purchase the unprocessed American cheese? We love the Organic Valley American Slices! I would love to buy those. I live in Canada and I don’t think they are available here. They sure are. Amazon Canada or EasyLunchboxes’ website. are amazing. Thank you for this delicious, healthy recipe. Yay! Glad you were able to make it with a dairy free alternative! How do you keep the quesadilla from getting soggy? Doesn’t condensation form in the container? And what type of container do you use and what kind of insulated lunch box? Do you have a favorite brand?